Yesterday I went for a walk on Mt Wellington for a while. It was supposed to be a warm day, but it remained overcast with a chilly breeze on the mountain slopes. I discovered part-way around that I seemed to be doing the "Organ Pipes Walk" which is one of the 60 Great Short Walks. There didn't seem to be very many people around. 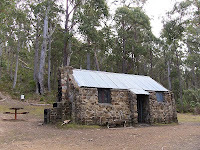 This walk sets out from The Springs, climbs beneath the Organ Pipes, then descends to Junction Cabin via Hunters Track. The last bit is the gentle climb back to The Springs along the Lenah Valley Track. This is a good walk on a day when you don't want to climb to the summit. 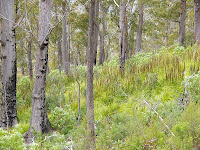 The forest below the chalet along Hunters Track and through along part of the lenah Valley Track shows the effects of fire a few years ago. As I recall, this was a deliberately lit blaze that started behind Glenorchy and climbed the mountain, cutting quite a swathe through the nearly 40 years of regrowth since it was devastated by the 1967 fires. It wasn't as devastating as the earlier fire though, and the forest is recovering. The light yesterday wasn't very inspiring for photographs, but the walk was welcome exercise after a week at work. Junction Cabin is a cosy place on a wet day as long as someone has lit a fire. The area around here has been used for camping as well at times, and I have heard people say it was the first place they took their young children for an overnight walk. The grassy areas around the hut are a little slopy, but you could certainly put a tent up. The hut has a water tank and table/benches inside. There is often a supply of firewood left here by the rangers/council.